CAN-AM ON-ROAD. INSPIRED BY YOU. More than mere accessories, the Can-Am On-Road customization experience is part of a unique lifestyle. Transform, break free, and ride along the edge of comfort & excitement with a look & feel you can call your own. 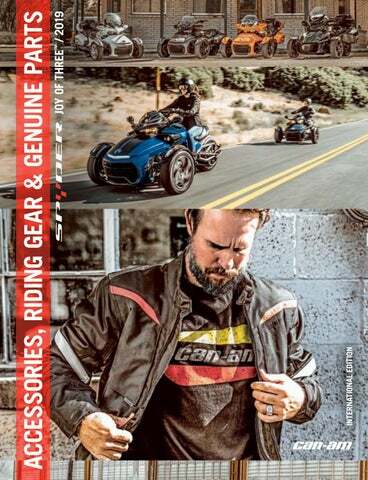 This catalog, global in nature, shares BRP's parts, accessories and clothing product offering. Some products may not be available in your country, due to different climates, local certifications and/or legal requirements. Contact your BRP dealer for local specifics. As ever, we’ve gone further to ensure that everyone who wakes up mornings hoping to enjoy the Can-Am On-Road experience feels included. We count on the opinions of thousands of open-road enthusiasts. They power our innovation, and inspire us to create better, more compelling products. Designed for men and women alike, we’ve got something for every rider and every style of ride. If it’s comfort and fashion you’re looking for, or simply want the ultimate in personalized style and performance, then you’ve arrived. It’s all here, easy to understand and even easier to love. Can-Am On-Road: gear up for an unforgettable year of exploration and exhilaration. We may build it, but it’s fueled by your imagination. Welcome to the all-new, all-yours, ultra-enhanced Can-Am On-Road. Visit your preferred dealer and start enhancing your Can-Am Spyder experience. © 2018 Bombardier Recreational Products Inc. (BRP). All rights reserved. ®, ™ and the BRP logo are trademarks of BRP or its affiliates. 3M and SCOTCHLITE are trademarks of 3M Company, BLUETOOTH is a registered trademark of Bluetooth SIG, CLARINO is a trademark of Kuraray Co. Ltd, FOX and PODIUM are trademarks of FOX Racing Canada, HIPORA is a registered trademark of Kolon Industries, iPOD and iPAD are registered trademarks of Apple Inc, TEFLON is a registered trademark of E.I. DuPont de Nemours & Co, LEXAN is a registered trademark of SABIC Innovative Plastics Holding BV, PINLOCK is a registered trademark of Pinlock Group B.V, NCOM SYSTEM and NOLAN are registered trademarks of Nolan Helmets S.P.A, NGK is a registered trademark of NGK Spark Plugs Ltd, RAM is a registered trademark of RAM Mounting Systems Inc, SENA is a trademark of Sena Technologies, Inc, SILICONE is a registered trademark of Dow Corning Corporation, TECHNO GI is a trademark of TECHNOGI spa, VELCRO is a registered trademark of Velcro Industries, YKK is a registered trademark of YKK Corporation, YUASA is a registered trademark of Yuasa Batteries Inc, Brembo brake systems is a registered trademark of Brembo S.p.A, GARMIN and ZUMO are trademarks of Garmin Ltd, AKRAPOVIC EXHAUST SYSTEM TECHNOLOGY is a registered trademark of Akrapovic d.d. SHAD is a trademark of NAD S.L., CYCLOPS is a registered trademark of CyclopsGear, RoadThunder and MTX are registered trademarks of MTX Audio, Ogio is a registered trademark of Madison, a division of H Young Ltd. All other trademarks are the property of their respective owners. All vehicles presented in this brochure are fully accessorized and may differ from what is available in stores. Prices, if shown, are based on Manufacturer Suggested Retail Prices. Dealers may sell for a different price. For Canada & US taxes are not included. 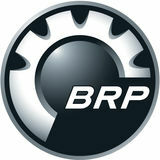 Depending on location, products are distributed by BRP US Inc., Bombardier Recreational Products Inc., BRP European Distribution SA, BRP Finland Oy, BRP Australia Pty Ltd., BRP Mexican Distribution, BRP Japan LTd., BRP Brasil Motorsports LTDA or Bombardier Recreational Products Motores da Amazonia Ltda. BRP reserves the right, at any time, to discontinue or change specifications, prices, designs, features, equipment without incurring obligation. ACCESSORIES Free spirit, adventurer, non-conformist. That’s you. That’s your ride. Define your own freedom. Rule the road on your terms. Customize, personalize, and revolutionize your ride, your way. That’s Can-Am Spyder accessories. ACCESSORIES Fuel your imagination with accessories designed to enhance the dynamic, spirited ride of your Spyder F3. Tweak performance, create your own mix of cruiser-specific ergonomic options, or choose a distinctive look that shows your true colors. Let our customized versions of these Can-Am Spyder serve as inspiration for creating your own! How would you build yours? Some products may not be available or homologated in your region. Contact your dealer for more information. Looking to personalize your Can-Am Spyder? Here is one of countless possibilities. YOUR CAN-AM SPYDER. YOUR FIT. Five footpeg positions and five handlebar options to optimize your fit and comfort. All Spyder F3 models feature our exclusive UFit system so you can customize an exact fit based on your height or preferred riding style. FIND YOUR PERFECT SPYDER FIT AT UFITSYSTEM.COM OR VISIT YOUR DEALER TO TEST DRIVE AND ASK ABOUT THE SHOWROOM FIT TOOL. BRAKE & SHIFTER LINKAGES · Part of the UFit System. · Find the best driving position for you. · Replace stock linkage to set pegs to different positions. All F3 SE6 models All F3 SM6 models –2	· Position 1	· 219400561 –2	· Position 1	· 219400560 –1	· Position 2	· 219400563 –1	· Position 2	· 219400562 +1	· Position 4	· 219400566 +1	· Position 4	· 219400564 +2	· Position 5	· 219400571 +2	· Position 5	· 219400565 Some products may not be available or homologated in your region. Contact your dealer for more information.  DJUST UPWARDS, A DOWNWARDS, FORWARDS, BACKWARDS, AND OUTWARDS. · D oesn't fit when the Top Case with Integrated Passenger Backrest (219400897) is installed. Can-Am Spyder accessories are subject to the same rigorous physical testing requirements as the vehicles. BRP partners with SHAD†, a recognized leader in the manufacture of high-advanced motorsport bags and storage accessories. Their designs are known to be the state-of-the-art, totally functional and of first class quality, which have earned them the prestigious international “Red Dot: Best of the Best” award in 2015. ENHANCE LOW BEAM LIGHT FOR BETTER VISIBILITY. · Integrated ON/OFF switch. · Not EC compliant. 24 SPYDER F3 LIGHTS & ELECTRICAL ACCESSORIES Zumo 590 GPS has the ability to link itself wirelessly to optional Garmin tire pressure sensors and the Garmin Virb video camera for enhanced GPS functionality. COMES WITH 8 MOUNTING ACCESSORIES.  HEEL NUTS ARE W HIDDEN BEHIND THE CENTER CAP. EVERYTHING NEEDED TO TRANSFORM A 2-UP INTO A 1-UP. A bobber, originally called a ‘bob-job’ from the 1930s through 1990s, is a style of custom motorcycle. The typical construction includes stripping excess bodywork from a motorcycle, and shortening the rear fender, which is “bobbed” (as in bob-tail). FOX† shocks have been an industry leader in high-performance shocks and racing suspensions for over 30 years. UPGRADE YOUR GROWL AKRAPOVI SILENCERS TOP FEATURES · Deeper, more guttural sound than stock silencer. · Meet the most stringent standards - EPA, CARB & EC certified. · Maintain vehicle warranty requirements. · Easy installation. · Exhaust fit compatible with all BRP genuine accessories. Akrapovi was established in 1990 by Slovenian racer Igor Akrapovi who had found that during his racing career there was a distinct lack of high-quality exhaust systems on the market to the public. ACCESSORIES Cover the distance from ordinary to extraordinary more smoothly & comfortably with accessories designed for epic rides and endless open-road freedom. Customizing your Spyder RT luxury touring experience begins here. Adventure, made better. There are a thousand ways to trick out a Can-Am Spyder. Take a look at ours and let your imagination run wild. EASY ALLEN KEY ADJUSTMENT SYSTEM. Three different axes enable you to adjust the handlebar height, width and arm distance. The left and right sides of the bar are linked so they’re always in sync. Moving the driver's seat position back just two inches (50 mm) relaxes the knees and upper body. · Driver backrest ready. · Perfect for taller riders. · Dual range Hi/Low heat setting. · Activated through stock passenger and driver heated grip controls. CAN ALSO DOUBLE AS AIRPLANE CARRY-ON LUGGAGE. CB & COMMUNICATION SYSTEM · For staying in touch with friends across a range of 40 channels. · Handlebar controls allow push-to-talk and adjust squelch levels for maximum performance and reception quality. · Fully integrated system also mutes radio while in transmitting and receiving modes. · Plug-and-play system controlled via vehicle’s cluster. · Works in conjunction with wired Communication Headset (4474380090). · Entertainment Harness (219400610) required for installation. · AM/FM Integrated Audio System (219400464) also required for Spyder RT 2012 and prior models. · The support conveniently swivels to offer the right position for all riders or light conditions. · GPS sold separately. · Li-ion battery capacity of 1050mAh, working time of 1/1.5 hours and charging time of 3 hours (2 batteries included). · WiFi function remotely operates up to 15 m (49.2') with mobile devices and CYCLOPS app for Android and IOS. · Features modes such as invert, time lapse, high speed & loop recording, motion detection, capture (while recording a video), burst and anti-sharing. · Comes with 8 mounting accessories. ·W  aterproof case up to 50 m (164'). ·W  i-Fi available to remotely control your camera from your smartphone or computer with the free CGX2 App. · 1 6 modes and effects, including driving mode, loop recording, time lapse and slow motion. · C omes with 10 mounting accessories. · C ompatible with VR goggles. · A n adapter may be required for latest-generation iPod or iPhone. · S tandard on Spyder RT and ST Limited packages. · L ocated in the front compartment on Spyder ST and in rear compartment on Spyder RT. · C heck compatibility with your dealer. · Fee-based monthly subscription required. · Entertainment Harness (219400610) required for installation. · AM/FM Integrated Audio System (219400464) is also required for Spyder RT 2012 and prior. · Headset sold separately. You can make any year Can-Am Spyder look like the latest by simply changing the fenders. All Can-Am Spyder accessory exhaust systems meet all the most stringent EPA, CARB & EC standards. AKRAPOVI SILENCERS TOP FEATURES ∙ Innovative Design. First hexagonal shaped silencers. ∙ The best materials. Premium titanium shell construction with carbon fiber end cap and heat shield render these silencers 55% lighter than the stock silencer. ∙T  he unmistakable sound of Akrapovi . Deep resonant sound that you won’t hear anywhere else. ∙ EPA, CARB and EC certified. Rigorous measurement, testing and quality control ensure silencers meet the most stringent standards. ∙E  xhaust fit compatible with all BRP genuine accessories. RIDING GEAR Look beyond the horizon, to all of those unseen, unexplored destinations that never seem to stop calling you. Listen to your heart and head out… anywhere. In fact, the farther the better. Don’t just live your dreams; ride them – intensely, completely, and without hesitation. Anywhere you’re headed is home when you’re riding the Can-Am On-Road experience. LOOK AS GOOD AS YOU RIDE. Use this guide to find the features you want by looking for the corresponding symbol among our extensive collection of jackets. 100% waterproof To keep dry in all conditions. Water-resistant To keep dry in light rain conditions or during short rides. Windproof To protect from air infiltration. Removable insulated lining To adapt to the current temperature. Wear when cold, remove when warm. Adjusted fit Fits closer to the body. Relaxed fit Looser fit for relaxed riding position. Pockets for removable protectors Pouches to insert removable protectors. Critical seams and logos are sealed, so water can’t enter through potential openings. 100 % of seams and logos are sealed, so water can’t enter through potential openings. TEXTILE MEN'S & LADIES’ CALIBER JACKETS FEATURES · Teflon†-treated highly wear-resistant fabric with all critical seams sealed. · Extensive chest-area ventilation. · Cushioned collar edge prevents chafing. · Back armhole gussets improve movement & flexibility. · Shaped sleeves. · Multi-adjustable biceps, forearms, wrists, and waist. MEN'S CALIBER JACKET 440822 · S, M, L, XL, 2XL, 3XL · Red (30), Black (90) Some products may not be available or homologated in your region. Contact your dealer for more information. · Superior comfort in almost any weather condition. · High breathability ensures dryness. · Highly-durable for extended wear and long-distance rides. · Easily adjustable for optimum mobility. · Enhanced low-light & nighttime visibility for added safety. · Teflon-treated highly wear-resistant fabric. · Shaped sleeves. · Action pleat gussets at back armhole for extra comfort and ease of movement. · Critical seams sealed. · Chest and back ventilation. · Outstanding ventilation, lightweight for extra comfort. · Breathable to keep you dry. · Excellent flexibility and rider fit. · Wind and water protection. · Ultra-durability and wear resistance. · Convenience, good practicality, and nighttime visibility. MADE OF HIGHLY BREATHABLE MESH. ·M  ade of highly breathable mesh. · N o collar. · S haped sleeves. · A djustable waist, biceps, forearms and sleeves openings. · 3M† reflective details at back. · Lightweight comfort with outstanding breathability. · Excellent flexibility and rider fit. · Convenience, practicality, and nighttime visibility. FEATURES · A ll critical seams sealed. ·W  ear-resistant fabric. · C hest-area ventilation. · C ushioned collar edge prevents chafing. · S ide-bottom and back armhole gussets. · S haped sleeves. ·M  ulti-adjustable biceps, wrists, and waist. BENEFITS · E xcellent comfort & protection in many weather conditions. · H igh breathability ensures dryness. · E asily adjustable for optimum mobility. · E xtended-wear durability. · L ow-light & nighttime visibility for added safety.  LL A CRITICAL SEAMS SEALED. SHAUN PLUS & EMMA PLUS MESH JACKETS FEATURES ·M  ade of highly breathable mesh. · N o collar. · S haped sleeves. · A ction pleat gussets at back armhole for extra comfort and ease of movement. · Outstanding breathability and extra roominess, for comfort. · Excellent flexibility and rider fit. · Convenience, practicality, and nighttime visibility. FOOTWEAR SPYDER RIDING BOOTS · P erfect for rain or cold weather. · Water-repellent leather. · H ipora waterproof breathable membrane with 100% polyester lining padded with open cell foam for better comfort. · 3M† Scotchlite† reflective detail on back. · High-tech rubber composite sole. · Sole structure offering a good grip under all conditions. · Molded nylon shin guard backed with shock absorbing material. 444208 · 7, 8, 9, 10, 11, 12, 13 · Black (90) See p.87 for European footwear equivalencies. CAN-AM N40-5 JET HELMET FEATURES · Ultra-wide scratch-resistant visor. · Multi-adjustable anti-fog scratch-resistant VPS† sunshield with UV400 protection. · E xclusive AirBooster† technology drives innovative ventilation system. CAN-AM N40-5 JET HELMET 448572 · DOT · White (01), Magnesium (24), Matte Black (93) 448591 · ECE · Matte Black (93) XS, S, M, L, XL, 2XL Helmets shown are not available in Brazil. Contact your dealer for local helmets. · Delivers a superior field-of-vision for a safer ride. · Engineered for superior anti-glare, anti-fog capability. · Ultra-comfortable, and equipped with intelligent ventilation for superior temperature and humidity control. BENEFITS · Superior quality and great look. · High-impact resistance and comfort. · Good visibility and practicality. · Anti-bacterial, anti-fungal and moisture wicking for added comfort and hygiene. · Added safety and convenience. Helmets shown are not available in Brazil. Contact your dealer for local helmets. · F ully N-Com System-ready. · Super-strong lightweight, aerodynamically-tuned polycarbonate shell with integrated spoiler. · E xclusive Crossover technology. · O ptically-correct face shield protects the entire face while offering a large eye port and can be changed in seconds. · Exclusive Vision Protection System (VPS†) features a scratch-resistant, anti-fogging, UV400 sunshield that raises or lowers in an instant. · Improved performance, stability and excellent high-impact resistance. · Ultra-convenient accessory addition or replacement, maintenance, and customization. · Added safety, exceptional field of vision and convenience. · Protection against sun, glare, and condensation. · Exceptional ventilation for improved temperature control. · Anti-bacterial, anti-fungal and moisture wicking for added comfort and hygiene. · Convenience and comfort. ONE HELMET, FOUR LOOKS Quick-change accessories allow you to customize the look and features for every ride. · Fully N-Com System-ready. · Super-strong lightweight, aerodynamically-tuned polycarbonate shell with integrated spoiler. · Optically-correct UV400 face shield protects the entire face while offering a large eye port and can be changed in seconds. · Exclusive Vision Protection System (VPS) features a scratch-resistant, anti-fogging, sunshield that raises or lowers in an instant. · Improved performance, stability and excellent high-impact resistance. · Added safety, exceptional field of vision and convenience. · Protection against sun, glare, and condensation. · Exceptional ventilation for improved temperature control. · Anti-bacterial, anti-fungal and moisture wicking for added comfort and hygiene. · Convenience and comfort. · U ltra-wide scratch-resistant visor with silicone-sealed profile Pinlock fog-resistant inner visor. · Multi-adjustable anti-fog scratch-resistant VPS sunshield with UV400 protection. · Exclusive AirBooster technology drives innovative ventilation system. · Complete with chin guard air intake and rear extractors. · Patented Microlock double lever retention system. · Delivers a superior field-of-vision for a safer ride. · Engineered for superior anti glare, anti-fog capability. · Designed to prevent accidental visor opening, closing, and foreign matter infiltration. · Ultra-comfortable, and equipped with intelligent ventilation for superior temperature and humidity control. · Stylish, sporty design. · Eyewear compatible. ENHANCE THE EXPERIENCE. Get your message across around every curve, into any headwind, and in the noisiest traffic with our in-helmet communication systems. A lot happens when convenience, comfort and cutting-edge technology come together to create effortless communication. Whether you’re out for an hour or in it for the long haul our systems ride with you, letting you stay in touch in almost any driving condition. · Innovative Bluetooth† 4.1 communication system with advanced adaptive Mesh-Intercom Technology. · 13-hour Bluetooth intercom / 8-hour Mesh-Intercom talk time with 1.5-hour. charge. · Open terrain range: Bluetooth 1.6 km (1 mi), Mesh 2 km (1.2 mi). · Separate headset (HSP) and hands-free profiles (HFP). · Advanced Noise Control†. · Integrated FM Radio with 10 stations preset and auto-scan tuning. · 700 m range rider-to-passenger or vehicle-to-vehicle communication. · Conference-call ability. · Full cross-platform Bluetooth compatibility. · Voice-activated. · Bluetooth connectivity iOS† and Android† smartphones and A2DP MP3 player with auto-mute during incoming calls. · Integrated FM Radio with 6 station presets and auto-search & tune. · Satellite navigator integration via Bluetooth (compatible models only). · Windows† and OS X† compatibility. Bluetooth Universal Intercom Intercom Connections* Cell Phone and/or GPS and/or MP3 Player Compatible Advance Noise Control FM Radio Voice Command Smartphone application Helmet Integration *Can be connected via Bluetooth to intercom systems of other brands. SPORTSWEAR You’re unique. You’ve always known the journey was the destination, and Can-Am On-Road the only way to get there. Confidence, determination, and a sense of adventure got you this far, so wear your heart on your sleeve, and enjoy the ride in style. IF WE SELL IT, WE STAND BY IT. GET ALL THE DETAILS FROM YOUR CAN-AM SPYDER DEALER *	Purchased at an authorized BRP dealership / distributor or on a BRP-authorized online store. Other exclusions may apply, see complete limited warranty or contact your Can-Am Spyder authorized dealer. **	Unless otherwise stipulated or required by law. This limited warranty does not apply to factory installed accessories. This limited warranty does not apply on Evinrude parts and accessories. For best results, have someone else take measurements. Measure body in underwear. Tape must be snug but not tight. If measurements fall between two sizes, order the larger size. Measure around your natural waistline, keeping one finger between the tape and body. Let hands down the side in a slightly bent position. Measure from center back neck bone, along shoulder point and elbow, to bottom of wrist bone. WHAT CODE REPRESENTS YOUR SIZE? REMEMBER WHAT MADE YOU FALL FOR A CAN-AM SPYDER? Precisely engineered. Rigorously tested. Factory approved. The Ultimate Can-Am On-Road experience continues with the Genuine Can-Am parts. GENUINE PARTS THAT SET THE STANDARD 1 YEAR WARRANTY ON ALL GENUINE CAN-AM PARTS Regular maintenance ensures your Can-Am Spyder performance stays at its peak. Note: Please contact your nearest dealer for suggested retail prices of oil based products. Some products may not be available or homologated in your region. Contact your dealer for more information. · A concentrated blend of solvents with a powerful blasting spray that effectively removes grease, grime, brake fluid and other contaminants from brake components and metal parts without the need for disassembly. · E vaporates instantly and completely, leaving no residue to hinder performance. · C ontains no ozone depleters. 219701705 · 397 g / 14 oz. · A biodegradable non-toxic cleaner that removes dirt and road grime better than any other cleaner. · Simply spray on and rinse off. · When used as directed, XPS Can-Am Spyder Wash is safe for all roadster finishes. 219701703 · 946 ml / 32 oz. · Cleans, polishes and protects most metal surfaces, such as chrome, stainless steel, nickel, aluminum, brass, bronze, copper, platinum, magnesium and more. · Not recommended for use on anodized or clear-coated finishes. 219701707 · 226 ml / 8 oz. · R emoves dirt, grease, road grime and water marks easily and quickly. · N on petroleum based formula will not harm plastic finishes. 219702844 · 340 g / 12 oz. Note: Please contact your nearest dealer for suggested retail prices of oil based products. WHY XPS OIL IS THE PERFECT FIT FOR YOUR ROTAX ENGINE? Whether you purchased it as a necessity for transportation, or the pure exhilaration of performance, your Can-Am On-Road vehicle is an investment â&#x20AC;&#x201C; get the most out it. XPS lubricants are the only lubricants specifically engineered to do that with your Rotax-powered Can-Am vehicles. UNMATCHED RELIABILITY Get the most out of every mile on every ride. ULTIMATE PERFORMANCE Engineered to match the advanced performance of Rotax engines. MADE FOR THIS Developed with Rotax engines to deliver the best performance and lubrication in all conditions. VISIT THE CANAMSPYDER.COM PARTS & MAINTENANCE SECTION TO SEE THE FULL LINE OF XPS LUBRICANTS.